Product Report Card Reviews - Legit or Scam? Product Report Card Reviews – Legit or Scam? Product Report Card, found online at ProductReportCard.com, says that they give people a chance to earn cash rewards just by sharing their opinions on various products and in different research panels and surveys. 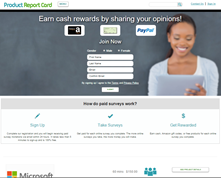 The homepage of Product Report Card provides examples of the types of surveys they offer their users, ranging from a 10 minute Ikea survey which pays one dollar to a research panel on new Microsoft applications which pays more than $100. The website says that their customers can take less than five minutes to sign up as one of their market research participants and membership with their website is completely free; you will never be asked to pay any fees. What Can I Expect from Product Report Card? Though the website does offer those examples of surveys, the reality is that not all surveys will be available to all members. In order to get started with Product Report Card, you will need to fill out a detailed member profile. In exchange for filling out multiple questionnaires about various aspects of your household – the members, their careers, their health and wellness, daily habits, and more – you will be provided with small rewards, generally about $0.25 per section you fill out. However, the more sections you fill out will ultimately provide you with the most survey opportunities, because the more specific you are about the demographics you fulfill, the more interested companies are likely to be in your opinions. Is Product Report Card Legit? By all appearances, Product Report Card appears to be an ethical, well liked and well regarded company whose goal is to honestly collect a large sample of consumer information in exchange for rewards like cash, Amazon gift cards, or free products. This company appears to meet all the requirements of a trustworthy market research company. They do not ask their members to pay any fees to be a part of their research community, and they are open and honest about the potential infrequency for rewarded projects. They are also honest about how the vast majority of their projects will pay around $1, and that customers must reach a minimum of $25 before they can pay out their account, which is the most common payout amount quoted in the market research industry. All-in-all, it appears as though this company would be a good choice for parents who are interested in making some extra money with online market research, and who only want to work with Legitimate Online Survey Companies. Product Report Card Reviews ? Average Rating for " Product Report Card Reviews " is 1.73 out of 5 based on 30 reviews. They give you surveys to fill out or products to try at home. Sounds good, right? Once the product arrives and you use it, you are supposed to evaluate the product when they send you a 'follow-up' survey to be completed in order to receive your "reward." When trying to complete such a survey, it can no longer be accessed or is "now closed." But hey, you do get to keep the product. Just don't expect anything else for your efforts. And trying to get a satisfactory answer about this from them is harder than getting paid! id id over fifty surveys and about two to three i was to get .25 and i complained and got no response from them. practically every one was declined. what? what a waste of time! now no site! ?%&^&* still receiving surveys! who collecting the money? surely not them? they would not do that? I requested payment three weeks ago and my request is still pending. Ridiculous. They take forever to respond to emails and when they do respond they don't take care of your issue. Don't bother. It can take time to get to $25, but they do pay. I completed a $150 baking study for them last year. My inquiries about payment were never answered, but they paid rather quickly once I filed a BBB complaint on them. I decided to give them a second chance and completed a $50 cell phone app study. Same shady practices. BBB has been filed. Avoid this company like the plague! BEWARE. TOTAL SCAM. I have experienced all of the above and concur that it is a TOTAL waste of time. I'm sure the companies pay them for surveys and then stiff the people that provide their time. Just a scam. Congratulations! Your ProductReportCard payment request has been approved. We will cut your paper check today in the amount of $180.60 and will mail it out tomorrow afternoon. Below are the specific details including who the check is made out to and where it will be mailed. Please reply to this email if any of the details are incorrect. We hope you are enjoying being an active member of our research panel and look forward to your continued participation. I contacted the company as it is now October 16th and no payment - no response from them. I've been with ProductReportCard for over 2 years. I almost never get to complete a survey and never have done an in-home product test. I realize there are criteria that the companies have placed on these things but honestly, I think the demographic is 18-30 with kids, married with a dog/cat/pet, home owners. I dunno. I'm tired of answering surveys and then told I don't meet their criteria...of course, after I answer their survey completely. I feel kind of used. $.10 for a 20 minute waste of my time is just not worth it. I'm about to dump them and after reading other's reviews, it seems if I ever did reach the $25 minimum cash out....it might never show up. Makes me very suspicious. ACOP has been pretty good to me. Pinecone at least allows me to take surveys. There has to be better consumer product review sites out there. The mobile site has technical issues. I cannot finish my profile to get more surveys. I can get a survey invite and respond to it all in one day. Every time I get this survey has closed. The odds of that happening every time is not realistic. It happens EVERY time.